John Renton initiated a number of changes and significant projects during his ministry at Kemnay Parish – these always led to an improvement to some aspect of church life. 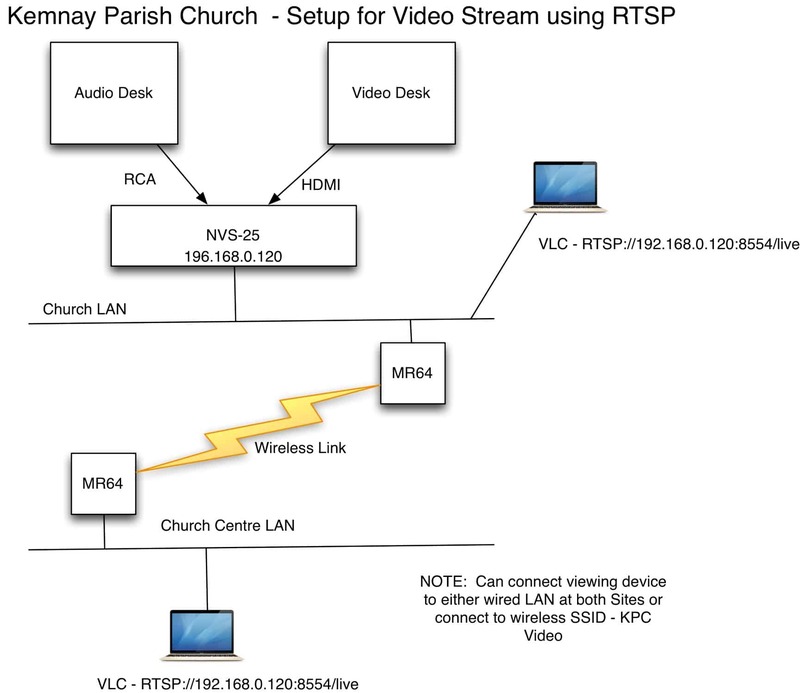 The project involved designing a system which allows church services to be recorded from various cameras positioned around the sanctuary and record and/or live web cast the resulting video stream. Viewers can then view the services either in real time or after wards when convenient from the service archive which is available through the web church web site. It is I think appropriate that I can report that KKAA did its first realtime webcast on the occasion of the funeral of our dear former minister Rev John Renton. This did not involve broadcast to the internet but it was possible for people who were involved in the catering team for the funeral tea to be at the church centre and to view the whole service at the there. The church was full to capacity with some people having to stand throughout the service. The following diagram shows schematically the setup which was put in place to allow the service to be viewed in the church centre. As you can see in the above diagram, there are two locations involved which are the Church and the Church Centre. Between the two site we have a point to point wireless link which has a capacity of approximately 15 Mbps. At the church we have a device which takes its audio from the church sound desk and a HDMI feed from the Video production system. These are combined into a single stream which is broadcast using one of a number of streaming protocols. On this occasion the RTSP protocol was used which was then viewed using a computer at the Church Centre. The video was then displayed on a large screen for people to view. VLC was the application which was to receive and display the video stream.